Filmed: during the summer of 1997 (June 27 – September) in Tunisia (Tozeur & Ksar Hadada), Italy (Royal Palace, Caserta, Campania) & England (Leavesden). 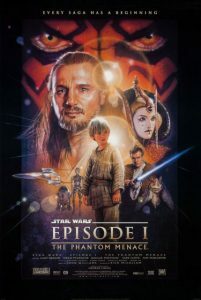 Plot Summary: When the evil Trade Federation plots to take over the peaceful planet of Naboo, Jedi warrior Qui-Gon Jinn and his apprentice Obi-Wan Kenobi travel to Naboo to warn the planet’s young Queen Amidala. Eventually, Naboo is invaded; forcing the Jedis to evacuate the planet with the Queen and her court. They travel to the desert planet of Tatooine where they meet a slave boy named Anakin Skywalker. They enlist his help in fighting the war. with them on their journy is Gungan outcast Jar Jar Binks, the powerful Captain Panaka and the small droid R2-D2, who will all travel to the faraway planet Coruscant in a futile attempt to save their world from Darth Sidious, leader of the Trade Federation, and Darth Maul, the strongest Dark Lord of the Sith to ever wield a lightsaber. and then things go to hell. Notes: Natalie hadn’t seen the original Star Wars films until after she was offered the part. She had a hard time shooting this film (“I don’t think I was very good,” she says, frowning. “I don’t want to make any excuses for myself at all, because I’m not proud of my work in that film, but I was really miserable while I was making it.”, Premiere, June 2002) and was injured twice on the set. Once when she sprained her ankle. and another time when a squib accidentally went off too soon and hit her in the eye. but she’s fine now. so don’t worry.